It is evident how discretionary effort is associated with engagement, and in some cases, it seems to be the natural result of the latter. Marc Woods, founding director of SladenWoods management consultants and a gold medal winning Paralympian, highlights how in today’s organisations, perhaps more than ever before, people matter. People’s actions are the main contribution to the success of an organisation. It seems there is a gap between what people are potentially prepared to do, and what they actually do, depending on the environment they’re working in, the organisation’s culture, their relationship with their manager or co-workers. These factors can stimulate people to stop from doing that little bit extra or going beyond the call of duty. 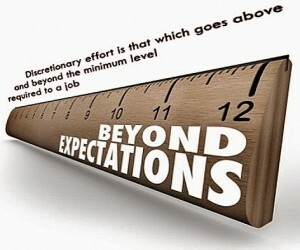 In the context of discretionary effort, trust operates on several levels. One factor that impacts on trust, and therefore discretionary effort, says Alf Crossman, a senior lecturer in industrial relations and human resource management at Surrey Business School, University of Surrey, is the psychological contract between employer and employee, in other words, how employees believe they are entitled to be treated and the kinds of promises that people infer from their employee relationship. If on the one hand, people are prepared to give, then on the other, they expect to get something back in return. According to Radford, even though the discretionary effort may be voluntary, it is important that organisations reward this behaviour to give the individual more consideration; on the other hand, they cannot take actions against who decides to not put in a bit more. It’s a matter of choice. According to a study commissioned by Aubrey Daniels International (ADI), the only way organisations can earn discretionary effort is through the effective use of positive reinforcement, that is any consequence that increases the probability of this behaviour. If people experience positive and immediate consequences, there will be more probabilities that people enjoying what they are doing will choose to go beyond the minimum required. After all, that’s exactly what happens in the everyday life, bringing the same attitude into an organisation, collaborating in building positive reinforcement. 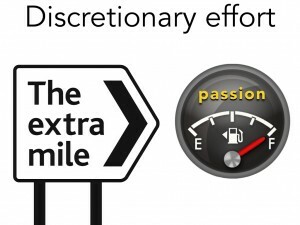 Reese Haydon, Marketing Specialist at DecisionWise, points out how discretionary effort varies by tasks – some of them can be more engaging than other ones and stimulate us to put in a bit more (extrinsic engagement) – or by person – according to this school of thought, the nature of task does not matter (intrinsic engagement). It is believed that both the theories are true. Engagement is a choice made by two parties: employer and employee. If the employee chooses to go beyond the minimum required, the employer needs to create an environment where the first one can be more engaged. 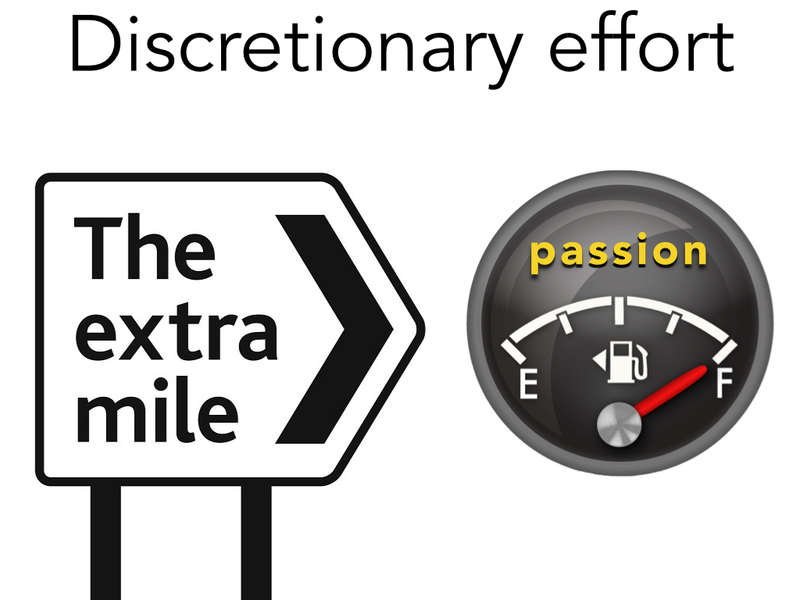 Discretionary effort and employee engagement seem to be a by-product of a two-part equation. When people enjoy, they are motivated to find solutions, are creative, guarantee a high level of commitment, a long-term and consistent relationship with the organisation. Are your tweets any good? 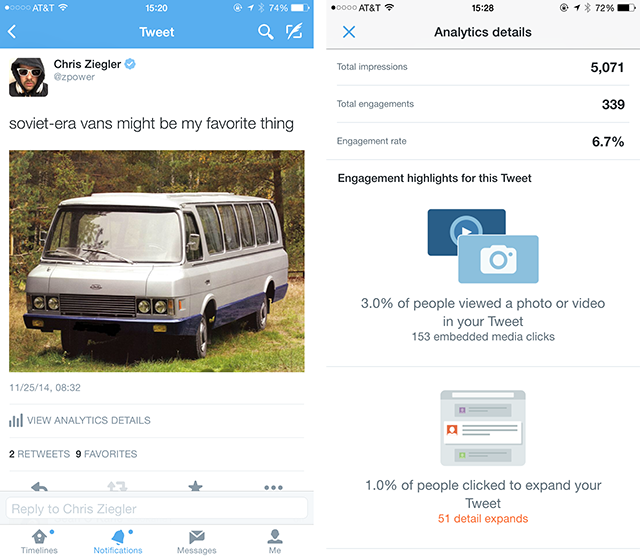 Twitter is experimenting with mobile tools to figure that out, thanks to the feature View Analytics Details on the bottom of the tweet view, showing the statistics of impressions, engagement, rate and more. Twitter started utilizing analytics for all users on its website last year. However, the new functionality makes it easier to access on phones. As explained by The Verge, not all the users have access to it and it is not clear when and if the news will reach all the users. The idea, as mentioned by The Next Web, is the promotion of the single tweet through an easy process. Nevertheless, the company does not make any comment and the feature has not been included among the news on the agenda, as it is probably still in a testing phase. The feature gets its data from Twitter’s Analytics platform, which was recently made available for anyone on the service to use. The logical evolution of this new feature would be to directly promote tweets inside the mobile app. It looks like a sort of social media monitoring on your Twitter account. Basically, you can find out how many people have seen and clicked your tweet. By monitoring your account, you can find out the results of your tweet and eventually increase them by reading the statistics, to be more engaging and improve your presence on the social media platform. According to him, the main goal would be to continue improving the home timeline. “We recently ran experiments that showed different types of content in your timeline: recommended Tweets, accounts and topics”, he says. According to TechCrunch, the quick glimpse at how your tweet is faring seems like something that would be very useful for brands and others who thrive on social media success. But the feature will probably go unnoticed or unused by most who don’t care about that kind of thing, probably getting close to Facebook, even though it is essential to figure out the different purpose of Twitter, that also involves a different range of users. On the one hand it fears a poor interest from the general audience, on the other it is believed that these experiments with engagement statistics directly in tweets can open a new frontier of communication on this social media platform. Also, whoever says that they don’t care what people think, are sometimes not telling the truth.